8 February 2013. In her book on “Silent Spring”, Rachel Carson fifty years ago wrote about DDT. In 2013, the notorious pesticide was featured in the publication from the European Environment Agency on “Late Lessons”. Today, DDT remains one of 12 insecticides — and the only organochlorine compound — currently recommended by the World Health Organization (WHO) for malaria prevention, and this use is permitted, despite DDT being listed on the Stockholm Convention on Persistent Organic Pollutants. In Mexico, DDT was used against malaria until 1998. Three years later, researchers began to collect blood samples from pregnant women and to enroll mothers and their children in a long-term study of child development. The blood samples were analyzed for DDT and its main metabolite DDE, which is highly persistent and remains in the body for many years. Both DDT and DDE may pass the placenta and enter the fetus. Studies in the US had previously suggested that DDE (along with PCB, another persistent chemical) could cause chemical brain drain. The Mexican researchers examined the children at six-month intervals up to age 5 years using standard scales for assessing neurobehavioral development. The mother’s serum concentration of DDE during the last months of the pregnancy was a clear predictor of deficits in the child. The DDE concentrations (averaging about 1 ppm in serum lipids) were high, and almost no DDT was present several years after spraying has stopped. The women’s exposures differed substantially, thereby providing statistical power to detect effects of the DDE exposure in the children at preschool age. 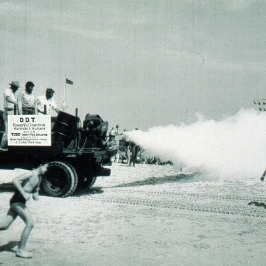 Other studies as well suggest that DDT is toxic to brain development. Thus, the pesticide seems capable of damaging brain development both as a result of recent DDT exposure and due to the break-down product that lingers in the body and the environment for decades.